Arnab Goswami and Sudhir Chaudhary must claim responsibility for attack on Kanhaiya Kumar, reward the attacker. Not so dear Sudhir Chaudhary and Arnab Goswami, I am sure that both of you would be very happy today. You have a big reason for the happiness, after all. It is not everyday that self-designated champions of a very violent and bigoted mutant of nationalism find someone responding to their call. Yes, I know that both of you did not really call for an attack, a physical one I mean, on Kanhaiya Kumar, president of Jawaharlal Nehru Students Union (JNUSU). You are sharp people; you know how to stop short of that, just short of that I mean. You know how to remain mostly on the right side of law, even while unleashing outlaw crowds to kill the dissenters; with the notable exceptions from Sudhir Chaudhary with stints in Tihar jail to boast about. You must be happy for your increased reach, it is not only lumpens organized in this or that Senas or Dals who carry out your orders. 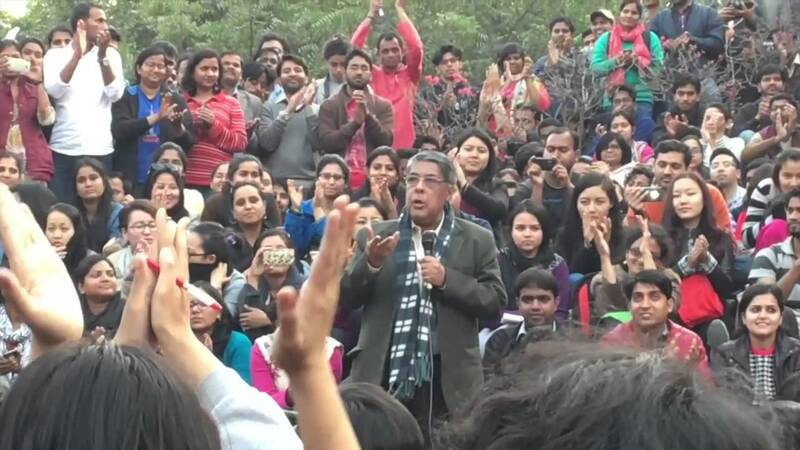 You must be happy for your message is spreading to loners, as it appears for now, and finding Vijay Chaudhary, a Ghaziabad resident travelling all the way to JNU to teach ‘traitor’ Kanhaiya a lesson. Never mind the fact that Kanhaiya is not a traitor. Never mind, also, the fact that as a member of Communist Party of India, a political party that has often been in power and has MPs in parliament, he cannot ever be. Never mind the fact that a court of law has released him on bail as Delhi Police could not offer any evidence of Kanhaiya shouting anti-India slogans, irrespective of the fact that Supreme Court of India has repeatedly held that even shouting them would not attract sedition charges unless followed by indulgence in or incitement to violence. I am certain that you, Arnab Goswami and Sudhir Chaudhary, would have none of it as you are self-designated custodians of the nation and its increasingly vulnerable feelings. You are the police, prosecution and judge all rolled into one. And you had declared Kanhaiya guilty on the basis of doctored videos, insinuations and what not. You had unleashed the lynch mob and set it after him, others. You may now claim the responsibility for the attack and reward the attacker as well. You should make him mascot of your prime time shows, news hour (howsoever long that hour could be) and DNA. You may also think about congratulating yourselves for bringing lone wolf attacks, largely confined to self-radicalised Islamists in the West, to India now. You should call upon the government of India to disband its police, prosecution and judicial institutions and delegate their powers to radicalized by you self-styled custodians of nationalism. It is just that they would come back to get you too, and not before long. Their sentiments are much more vulnerable than yours’ after all, and can get hurt by your positions too- like that on sexual minorities. I wish you the best to survive then. Till then, you should be a little sad for the failure of attack and organize a better one. 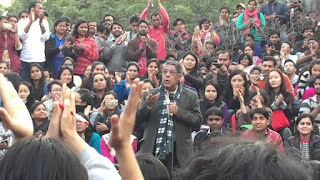 It would not be difficult, I guess as the very typical JNU response- of not beating the attacker to pulp, must have emboldened many other lone wolfs nationalised by you. Well written but do you subscribe that raising slogans against country also puts soldier in general public in particular at risk as it embolden the terrorist by providing legitimacy to their act.